Fresh from ACE we were egar to get to the root of the misfiring and power drop issues we had on the S13. The problem was intermitten but had gotten worse during my many tsuisos with Johan Norman. The practice session during day one wasn’t an exception but a sudden scent of burning wires had me cutting my practice short. The smoke and scent helped us locate the source which was to my relief was a mere ‘short’ed’ loose connection of the battery terminal . Such a simple overlooked item had basically cause me the chances of winning the ACE Dirft Challenge Series for the 2nd time running..Oh well , no point crying over spilt milk. The S13 performed flawlessly throughout the practice session with Jane looking real strong in her 180sx. Jane certainly looked like a contender with her consistant clean runs. Competiton day was a straight foward affair with me qualifying 3rd and Jane qualifying 9th with her impressive run! Tandem Battle had Jane advanced to past top 16 when she beat Shaffiq in his rotary 180sx but her run to further her position was cut short by Goodyear teammate Tan Tat Wei. Going through top 16 and top 8 was fairly smooth for me but during the best 4 battle, my handbrake suddenly decided to give up the ghost on me. It seems to refuse to lock. Thankfully I found this out during a taxi ride given to a VIP before my tandem run. I somehow managed , barely, through top 4 against Ah Boy from ACE but had to resort to clutch kicking when going against Tan Tat Wei during the finals. I managed to get the tail to decently kick out but due to some careless gear shifting work, I had shifted to 4th instead of 2nd at the rear clipping point !! During my turn to lead, Tan was on me throughout without missing a beat so I knew I had to make do with 2nd . 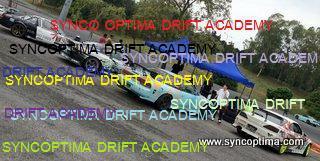 This entry was posted in Drifting, Goodyear, Posting by Ariff on May 18, 2011 by skagee.